Florida State University Department of Art has offered me nothing but good opportunities. Never would have I thought to have spent half of my summer interning in a gallery, which has been around for decades, and is well known and respected, by not only Tallahassee natives, but the local art community as well. 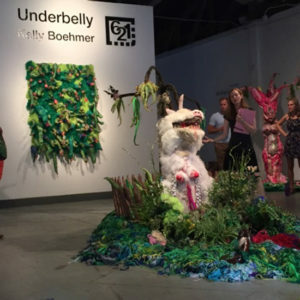 As a transfer student pursuing a bachelors in Studio Art, and coming from an art-proliferated community in Miami, Florida, working at the 621 Gallery in Railroad Square gave me an interesting opportunity to experience what goes on in a gallery behind the scenes. It also give me an inside look at how a gallery comes together (and apart) and the interpretative play of new changes and rules as directors change. On my first day working at the gallery, I was greeted outside with warm smiles and a cheerful “Good Morning!” The next forty five minutes were spent talking in a warm annex that’s next door to the main gallery, discussing new plans and challenges that were ahead as Haley Lauw and Elise Thompson took over the gallery for previous long-term director, Cynthia Hollis. After exchanging information, I played rock, paper, scissors for my first task with another intern, and spent two hours cleaning and touching up podiums, which were going to be used in the Kelly Boehmer exhibition in the main gallery. Although hard work was being done in a wooden warehouse with no central A/C, I loved every minute of it. Within a few weeks at 621, I learned how to patch walls, keep inventory, set up events, tend to visitors and most importantly, how to call patrons and artists that had artwork in the gallery store. Even when I made my first call and had no idea what the number to the gallery was, butchered the script, and stuttered in the middle of a voicemail, I was redeemed by Haley. In addition to the interesting new challenges we all had at 621 Gallery, my favorite part was talking to the guests and patrons during First Friday—Railroad Square Art Park’s art walk. Working at 621 led me to discover that it’s okay so explore and experiment with art and mediums of all kinds and most importantly, to have fun doing it. It’s also led me to make a handful of beautiful friends that I would have never met had I not worked there. I want to keep coming back to 621 to help the volunteers, directors, and new interns. I will try to land a job in a printmaking lab somewhere, so I hope that both Haley and Elise will give me references. They have been great to us all.